This should be obvious, but guess who these upcoming middle child memes are for? That’s right! These memes are absolutely perfect for every middle child in the world to share with their siblings. They are also good for sharing with friends who have also grown up as the middle child in the family! While these memes about being a middle child might be funny, let us all take a moment to sympathize with everyone who had to cope with being one their entire lives. Being a middle child is not easy! If it was, you will not see so many middle child memes on the internet. You see, the middle child has many roles. They are the peacemakers in the family, and you can count on them to be the sibling that shines through the best! They might go a little unnoticed when compared to the eldest sibling, but their efforts are the greatest! So, let’s take a look at the memes about middle children below and appreciate their roles in the family. Read popular middle child quotes too. 1. When You Realize… You Are Now The Middle Child. 2. 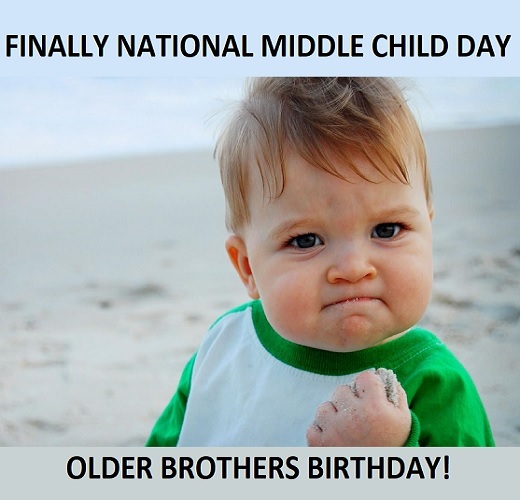 Happy Middle Child Day! Oh, You Didn’t Notice It Was Middle Child Day? Of Course Not, No One Ever Does. 3. Born Second Come Last! 4. Poops in House Still More Loved Than Middle Child! 5. DJ Is The Oldest And Michelle Is The Cutest And I’m Nothing. 6. When You Realize That You’re The Cream in The Oreo! 8. Finally National Middle Child Day. Older Brothers Birthday! 9. One Does Not Simply “Listen” to The Middle Child! 10. If There Are Only Two Kids Who’s The Middle Child?? 11. Oh, So You Are The Middle Child?? Must Be Sad No One Remembers You Because Of The Serial Position Effect! 12. Someone Doesn’t Seem to Be Taking The News So Well. 13. Oh You Forgot to Include The Middle Child? Tell Me More About Loving As All The Some. 14. They Don’t Understand Being The Middle Child Is So Hard! 15. When You Are The Middle Child And You Realize That You Got All The Good Genes! 16. Middle Child? Come Talk to Me When You Firstborn. 17. Happy Middle Child Day! 20. That Moment When He Realizes He Is The Middle Child. If you are a middle child, we sure hope that these posts are relatable for you! Even if you are an older or younger sibling reading this, hopefully, our middle child memes remind you of your own sibling. Remember to share these memes with your friends and family!